June is Alzheimer’s and Brain Health Awareness Month. Over 5 million Americans are living with Alzheimer’s disease. It’s the 6th leading cause of death in the United States. And one in three seniors dies with Alzheimer’s or another form of dementia (Statistics from the Alzheimer’s Association). These statistics are very high and chances are someone you love or know is a victim to this disease. The Alzheimer’s Association shared an article on “10 Ways to Love Your Brain”. These included exercise, education, quitting smoking, heart health, avoiding head injuries, getting adequate sleep, proper nutrition, mental health, social engagement, and challenging your mind through games and activities. Incorporating these 10 lifestyle habits can help reduce your risk of cognitive decline. For this post, I want to focus on ideas to challenge your mind through memory activities and games. These activities provide ways to keep your mind sharp, if your loved one has already progressed with dementia, some of these activities may need to be adjusted. Memory activities can be an enjoyable way to challenge yourself and even remain socially active. Here are five ideas to help you find the memory activities and games that are right for you. 1. Play Card Games. Playing cards offer a variety of ways to promote brain health and challenge your mind. For example, playing Bridge requires strategy and provides social interaction. 2. Complete Crossword Puzzles. The New York Times offers their famous daily crossword puzzle, but crosswords can be played at a variety of levels and even played on an app on your phone or tablet. 3. Learn a New Language. You are never too old to learn something new. Is there a trip you are planning for? Memorize phrases that may be useful to you on your trip. Or perhaps you have always wanted to learn a certain language. 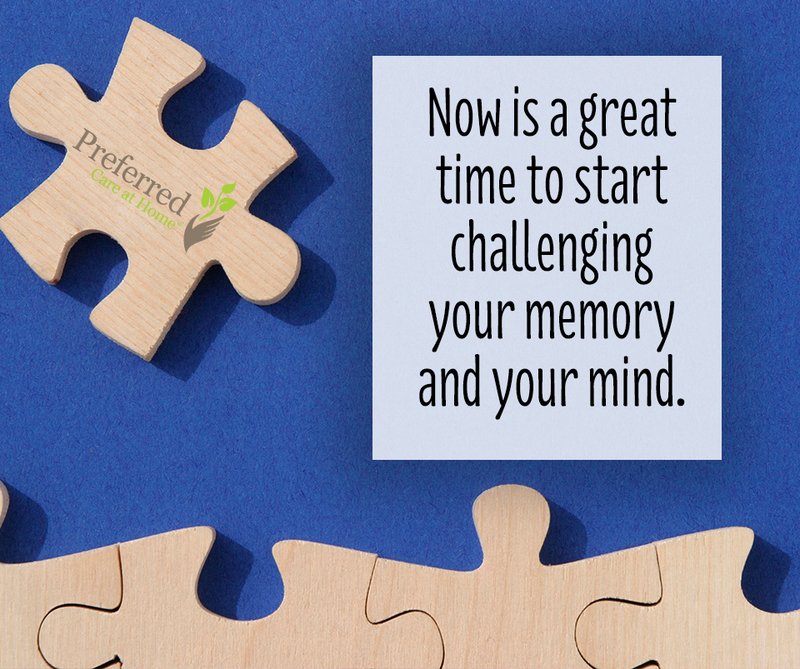 Now is a great time to start challenging your memory and your mind. 4. Assemble Puzzles. Puzzles can also range is complexity and can provide continued challenge at whatever level you find yourself. From simple images to 3D structures, puzzle assembly provides a fun brain challenge. 5. Learn a New Activity. Take a cooking class or attend a painting party. Contact your local art league to discover what beginner art classes are offered. Also, many senior centers offer a variety of classes, check their monthly schedule and challenge yourself to attend and learn something new. If there are activities or hobbies that you currently enjoy, look for ways to push yourself further with them. For example, if you like to read, try branching out into other genres or reading more difficult material. If you’ve always enjoyed tennis, join a league, take lessons to fine tune your technique. The bottom line? Continue to look for the next challenge, your memory will reap the benefit.